In a way, creating recipes is like reinventing the wheel. Somewhere, sometime, someone has put together a dish similar to what you’re creating. It might have even been you, especially if you belong to a CSA farm and get similar veggies for weeks at a time from a local farm. And so it is with strawberries in salad. I’ve combined them with spinach, Parmesan and pine nuts, with radicchio, butter lettuce, and feta, and simplest of all with arugula and goat cheese. And yet a bounty of mixed spring lettuce from our DIY square foot garden plus 5 pints of strawberries and some basil from our CSA inspired me to make yet another strawberry salad. I employed a labor saving device in this salad recipe: pre-made dressing. 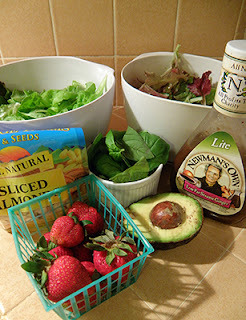 Newman’s Own Lowfat Sesame Ginger dressing has the exact flavor I wanted to combine with the strawberry, basil, and avocado. Sure, I could have tried to recreate Paul’s dressing. But since we love the dressing’s piquant flavor and low calorie count, and feel good about supporting Newman’s because they donate 100% of profits and royalties to charity, why reinvent this particular wheel? If you can’t get this dressing locally, pick it up online. 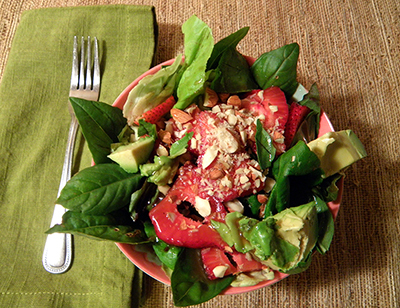 Or use my previously blogged strawberry dressing or balsamic-olive oil dressing. Or make up your own dressing…champagne vinegar might be nice. This salad works best with a combination of young lettuces, for varied colors and textures. It’s best if one of the lettuces is firm-ish, for example young romaine. Other green and red lettuces can be more delicate. 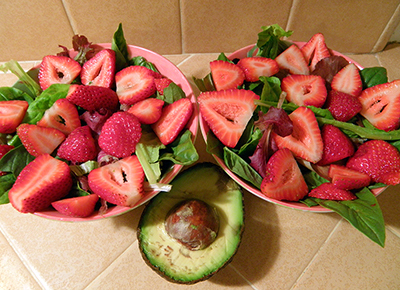 The idea is not to weight the salad down with the strawberries, almonds and avocados. You can accomplish this by jamming the bowls full of lettuce (using gentle pressure!) before adding the toppings, using more firm type lettuces, using shallow and wide bowls, and/or limiting the amount of topping ingredients if the salad starts to sink. Using lettuce and basil from your own garden, or fresh-picked from a friend’s garden will make this recipe taste even better. As always, adjust the proportions of ingredients to your liking. Enjoy! Second Salad Attempt: Sliced Nuts, Not Intoxicated. 5 – 6 cups mixed spring lettuces: young romaine, butter lettuce, oakleaf, red, etc. 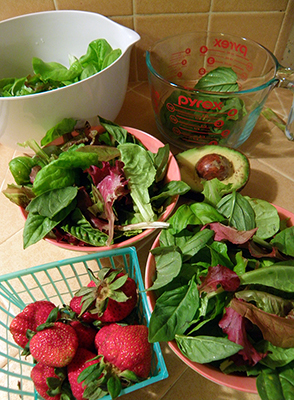 Wash lettuces well and dry in salad spinner. Blot off remaining water while filling two large salad bowls. Tear lettuces into bite sized pieces as necessary. Wash and dry basil leaves. Add small to medium sized basil leaves in an attractive pattern around the edge of the bowl. Tear in half if large. Wash and hull strawberries. Cut into slices. Place in attractive pattern on top of greens. Cut avocado into ½ - ¾ inch chunks. Place on top of strawberries. 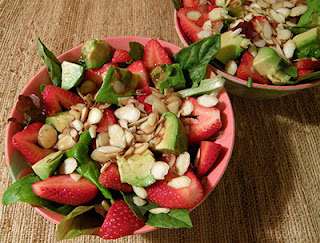 Sprinkle salads with chopped or sliced almonds. Add 1½ -2 tablespoons of dressing to each salad, pouring it on in a circular pattern. Serve with additional dressing.